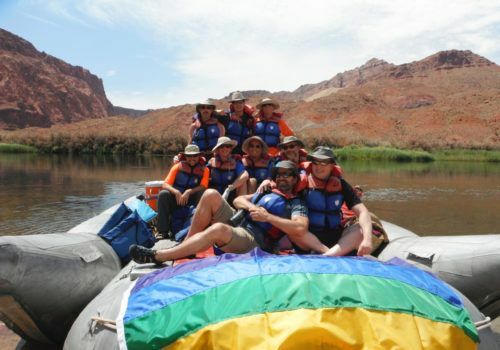 This incredible Grand Canyon gay group trip will take you on a real adventure down the Colorado River. You will explore the contrast between the excitement and thrill of rafting down the river’s rip-roaring rapids, and the peace and tranquillity of the silent nights. The Grand Canyon will completely overwhelm your senses with its immense size, grandeur and spectacular views, as you hike through remote canyons and cascading waterfalls. The trip begins in Las Vegas, where you’ll meet your fellow travellers and tour guide. Although only a short distance away from the Grand Canyon, Las Vegas feels like worlds apart both aesthetically and culturally. You’ll receive a quick introduction from the tour guides then the rest of the evening is at your leisure. Of course there’s plenty to do and see in Las Vegas, however you might want to get an early night as we’ve got a busy week ahead! Day 2 we’re up early to catch a bus to Lees Ferry. Located where the Paria River meets the Colorado River from the north, Lees Ferry’s quick access to the Grand Canyon makes it the perfect place to embark on our whitewater rafting adventure. On the way we pick up all the gear we’ll need and meet our two experienced guides who will make sure that you’re in good hands. 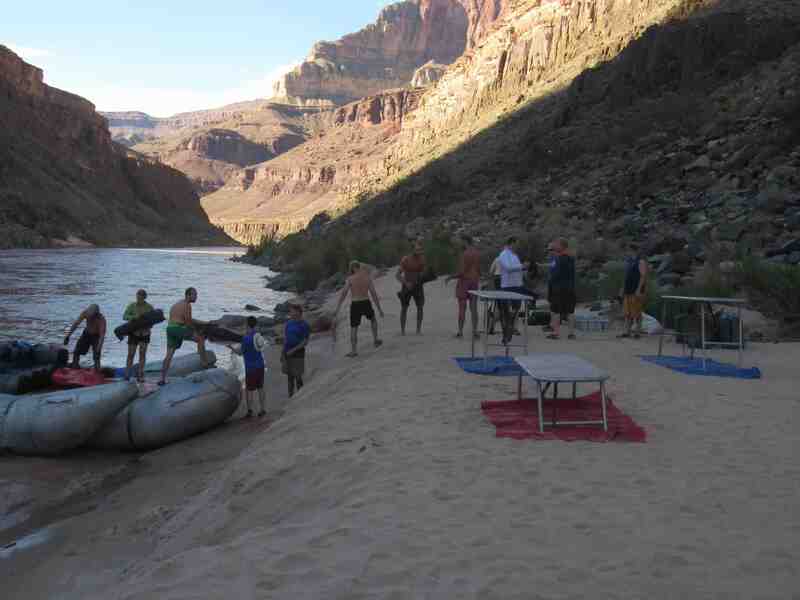 We’ll arrive at the Colorado River before lunch, board the raft, and we get underway on the river. Immediately we’re greeted by a Great Blue Heron returning to the nest after a fishing expedition, one of the canyon’s most famous inhabitants. 8 miles in we encounter Badger Creek Rapids, the first major rapids on this incredible adventure. Our tour guides will give you a rundown of the best rapid positions, as well informing you about the geology and history of the area. In the afternoon we’ll pull up on a beach where we’ll set up camp for the night. On Day 3, after we enjoy a cooked breakfast, we’re back on the raft, where 2 miles down the river, we’ll encounter the Roaring Twenties, a section of river that encompasses a number of rapids in quick succession between the 20 and 30-mile marks. These rapids might not be the biggest but they will certainly wake you up. After the Roaring Twenties, we’ll get off our rafts on the “South Canyon” embark on a short hike to Anasazi Indian ruins. These ancient Indian ruins are home to a 220-room Cliff Palace and are littered with 700-year-old pottery shards. We’ll then head to Redwall Cavern, a spectacular gash carved by the river, where you can either be adventurous and climb the rock or just marvel at its beauty. Dinner is then served fresh out of a dutch-oven on the river, to round off the day. Day 4 begins with another delicious breakfast before we head downstream to Nankoweap Canyon, where we’ll hike to another, bigger, more spectacular Anasazi/Hisatsinom ruin. We then officially enter the Grand Canyon, where Little Colorado River joins at Sipapu. The biggest and most challenging rapid on today’s itinierey is Unkar, where the water level drops 25 feet, along the course of the rapid. Day 5 we have a real treat for rafting enthusiasts. Today we encounter the biggest rapids we are yet to see on this adventure, the “Hance Rapids”. Hance Rapids are some of the most challenging rapids you’re likely to come across. With its 30 foot drop and many twists and turns, the rapids will definitely provide a challenge to most rafters. After Hance we have the opportunity to enjoy the scenery as the rapids briefly thin out. However, in no time we hit Sockdolager Rapid, then Grapevine Rapids, then Zoroaster Rapids — and we’re still only 10 miles from last night’s camp. Then we encounter Salt Creek Rapids, Pipe Spring Rapids, Granite Rapids, Horn Creek Rapids and the scary Hermit Rapids. After a long day of rafting we then hike up Shinumo Creek to a short, arching waterfall. Where we relax by the tranquillity of the still water for the afternoon, before setting up camp. In contrast to Day 5, today is all about hiking. This day includes incredible hikes to Elves Chasm, Blacktail Canyon and Stone Creek, as well as a brief encounter with the Dubendorff Rapids- some of the most beautiful spots that the Grand Canyon has to offer. With the night’s campsite only a few miles downstream, we’ll enjoy another cooked dinner by the campfire! We kick off the day with another cooked breakfast before we raft the Upset Rapids. These rapids are formidable, but fear not – you’re in safe hands.We then pass the Hualapai Indian Reservation, before we take a number of hikes round the National Canyon and take lunch is at Fern Glen Rapids. After lunch we hit the canyon’s famous Lava Falls Rapids which are both the grandest and most difficult rapids in the Grand Canyon – we round off the day with dinner and drinks at camp. Today we head up to Pumpkin Springs, a warm water spring. We indulge in the beauty of the area for next few hours, where we have lunch. As this will be our night on the river, we’ll enjoy a final delicious farewell dinner as we reflect on the highs and lows of the journey, before we turn in for the night. We’ll spend the evening at a nearby restaurant/bar, and catch one of Las Vegas’ famous shows, or you can enjoy yourself at a casino. Today we wish each other farewell and round of our incredible gay group rafting adventure.